Last night was (as we all know) Halloween. However, it was also the start of the Mexican holiday Día de los Muertos, or the Day of the Dead. It was something that I hadn’t even heard of until I was in middle school, and a traveling performing arts troupe did a short dramatization for us. To this day, I still remember being intrigued by it, and that started what continues to be a mild fascination with the Day of the Dead. For those that haven’t heard of it, don’t freak out. It’s not a morbid, gothic thing exactly. In fact, after studying the history behind the holiday itself, you find out that it’s actually a very meaningful part of ancient Hispanic culture. So let’s take it back. Way back. Back into time. When the Spaniards conquered the Aztecs around 1521, they tried to force Catholicism upon them in an attempt to try and eradicate their ancient religious rituals. In Catholicism, there are holidays called All Saints Day and All Souls Day that takes place November 1st and 2nd of every year. Although a large part of the Aztec culture was suppressed by the Spaniards, they still managed to preserve bits and pieces of their culture even in the midst of their oppression and cultural suppression. The Day of the Dead was one of those results. Celebrated from October 31st to November 2nd, it’s a shortened version of the Aztec Mictecacihuatl festival that gives honor and memoriam to loved ones who have passed away. One of the most common practices for the Day of the Dead is to build beautiful altars with flowers, candles, pictures of dead loved ones, as well as various Mexican foods. 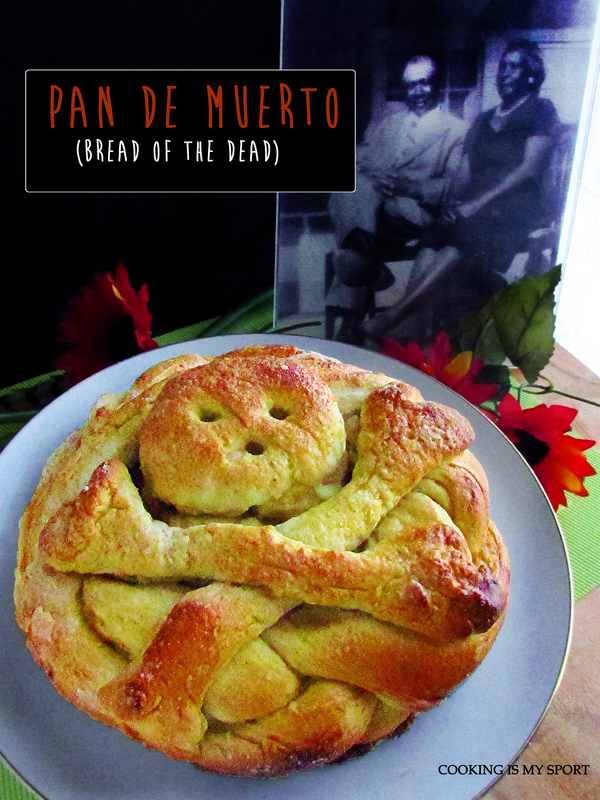 One of the most important of these foods is the Pan de Muerto- or in English, the Bread of the Dead. I’ve been waiting for months now to make this bread, not just because I thought the ingredients sounded great, but also because I think it’s just really cool to look at. 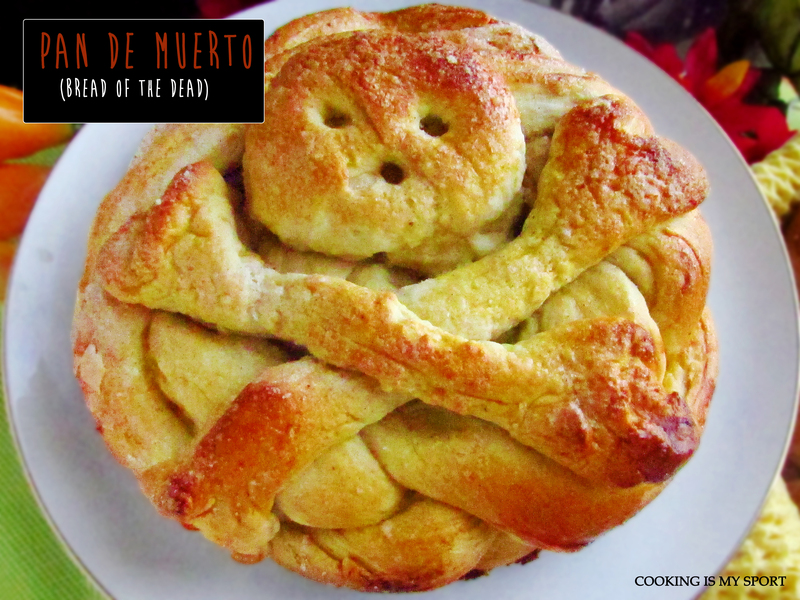 The bread’s shape is representative of the Day of the Dead itself, with the dough being shaped into bones that are topped with a skull. I’ll be honest, this reminds me a lot of the Jewish egg-based Challah bread, with the very notable exception of the anise in the Pan de Muerto that gives it a slight licorice aftertaste, as well as the delicious cinnamon sugar that gets sprinkled on the top just before it goes into the oven. It’s very tender and soft on the inside, and would also be perfect for later use in bred puddings or french toast. Plus like I said: isn’t it just SO cool to look at? Oh yeah, and those people in the picture? My great-grandparents, Isaac and Lily-Mae Haynes. They’ve passed away, so in a way I guess this bread is for them. Happy Día de los Muertos! 1. Put the yeast into a large bowl with the water, stir to dissolve, and let stand for about 5 minutes. Meanwhile, put the milk into a saucepan set over medium heat, bring to a boil, then remove from the heat and add butter, 1/4 cup of the sugar and the salt. Stir until dissolved. Add the milk mixture to the yeast mixture. 2. Add one egg and the flour to the liquid ingredients, mix to combine, then knead until a smooth, silky dough forms. Transfer the dough to a clean bowl, cover with plastic wrap, and let rise in a warm place for 2 hours. 3. Turn out the dough onto a lightly floured work surface and divide into four pieces. Set one piece aside. Using the palms of your hands, shape each of the remaining pieces into three ropes of equal length. 4. Line a baking sheet with parchment paper and lightly grease the paper. Weave the three dough ropes into a braid and join the ends to make a round loaf. Take the reserved piece of dough and shape it into 2 bones and a skull. Arrange these on top of the loaf and press lightly. Put on the prepared baking sheet and let rise for 45 minutes, to an hour. 5. Meanwhile, preheat the oven to 350° F. Mix together the anise, cinnamon, and the remaining sugar in a small bowl. 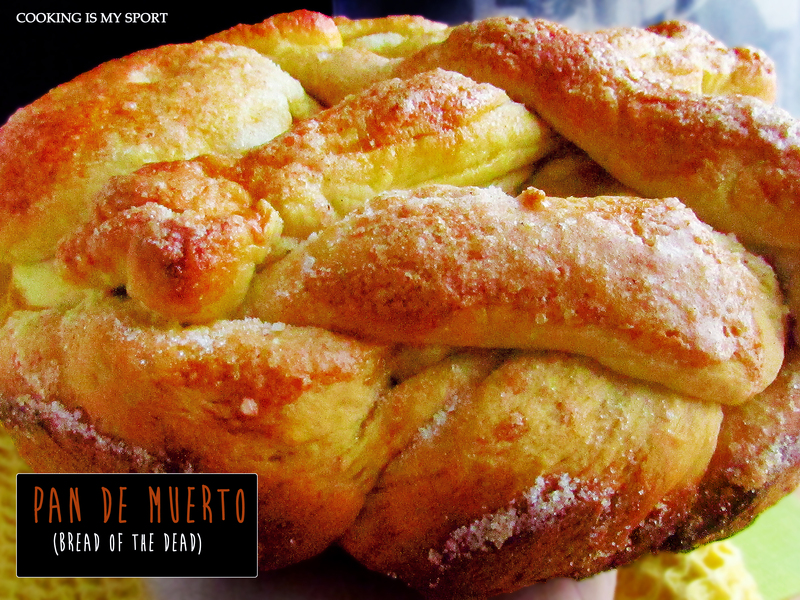 Beat the remaining egg and brush it onto the braided dough (do not brush the skull and bones), then sprinkle with the anise mixture. 6. Bake the bottom of the preheated oven for 20-25 minutes, until golden. If it’s browning too quickly, cover with parchment paper or aluminum foil. Remove from the oven and put on a wire rack to cool. Thank you, this is definitely one of my favorites I’ve made! Interesting to read the history on this Jess. The bread sounds lovely. Incredible that it is almost challah like!! Great bread and history lesson. Heard of the bread and the holiday (well sort of I guess) but never really knew that much about it. The bread looks amazing, looks so soft and tender. Cool photo of the grandparents by the bread. Thank you Suzanne, I love that the cultures share specific types of bread. Very cool to look at, Jess! And thanks for the history lesson…I love learning the origin of different foods. 🙂 This bread looks delicious! Wow this is so cool! Thanks so much for the fabulous idea! You’re welcome, thank YOU for stopping by! Very nice bread and the flavors (cinnamon and star anise) are amazing, Jess and thank you for the story 🙂 Have a nice week! This was my first time using anise and I was really surprised how much I liked it. Thank you! This is definitely an adorable bread to look at and eat! Thanks for following Jess! You’re welcome, thank you for reading!